Over the years I accumulated, at a guess, maybe a thousand vinyl LP's, starting in about 1983, with my purchases finally dwindling to zero in about 1995. A cull some years ago cut them down to only seven hundred or so. I bought rock, heavy metal, and a lot of Seventies stuff. At the time, like many people I knew then and know now, I was appalled at having to live through the Eighties with its manifold crimes against music and fashion. I retreated into squalling guitar and high-pitched vocals following a trip to an Iron Maiden concert in...1982, possibly 1983. It seemed the sensible thing to do. At some point I bought a guitar and set about learning to play it. These, plus a subscription to Interzone, pretty much kept me sane until the start of the Nineties. By the end of the Eighties I'd taken up writing for the first time since my early teens, more or less given up playing guitar, and was buying fewer and fewer records. The last album I ever bought in vinyl, I think, was White Zombie's Astro-Creep 2000 sometime around 1995. By that time I'd gone to dozens, more likely hundreds of gigs, but as the Nineties progressed I attended less and less. Even so, as I moved into different flats in and around Glasgow's West End, sharing with different people under different circumstances, I hauled my ageing record deck and vinyl albums after me, even though I rarely listened to them any more. They finally stopped being moved around when I used a fat chunk of the money I received for Angel Stations to place a deposit on a flat in the early '00's. The records went into a cupboard, along with the stereo, and they've remained there ever since. I could listen to music, perhaps, when I'm writing - as many do - but I'm one of those who finds any kind of sound above a barely audible murmur tremendously distracting during the creative process. Most of the time, I write in total silence. Sometimes I listen to SomaFM.com's 'drone' channel, to get a certain mood, but even that only very occasionally. 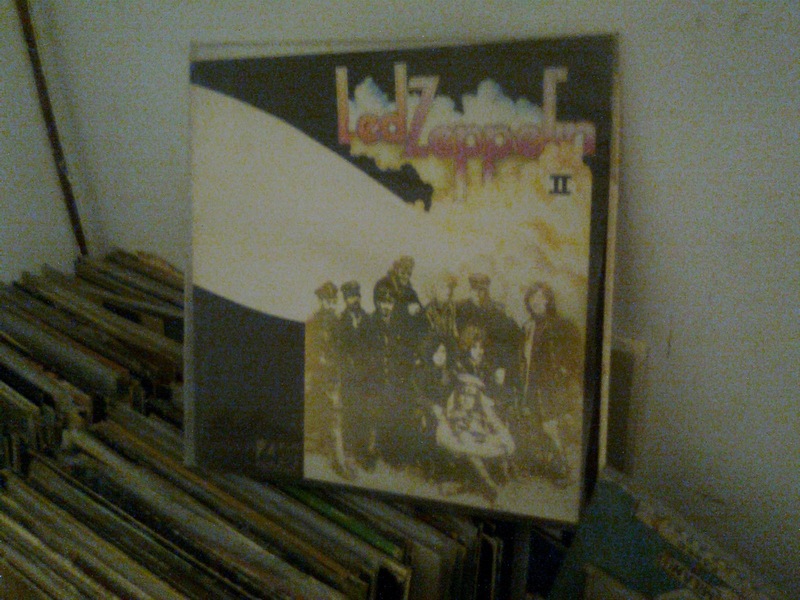 Of course, I don't need a vinyl collection any more. About ten years ago I burned a significant chunk of them to MP3 format, and still have them ready for whenever I want to listen to them. Even that isn't necessary any more, since I can usually find pretty much anything I want to on either Spotify or Grooveshark, and in seconds. 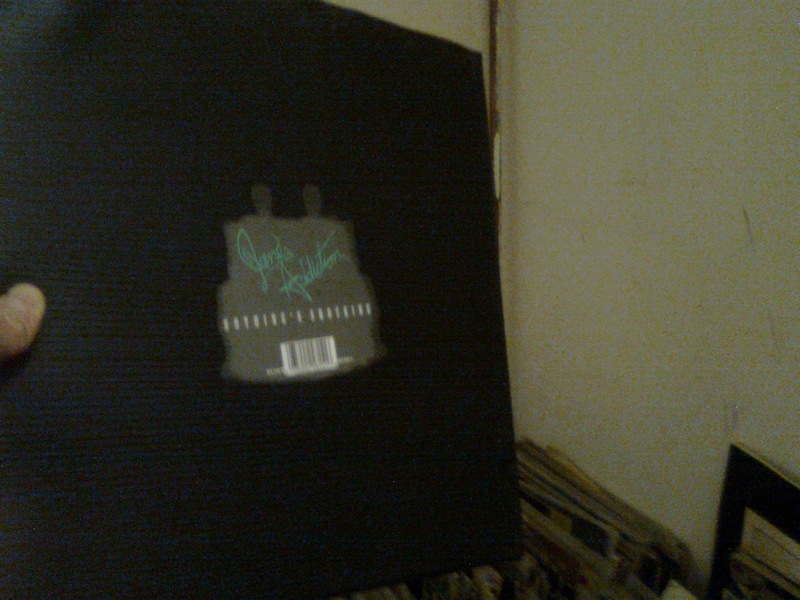 At the moment, a few feet away from me are my signed Joe Satriani albums, purchased sometime in the late Eighties. 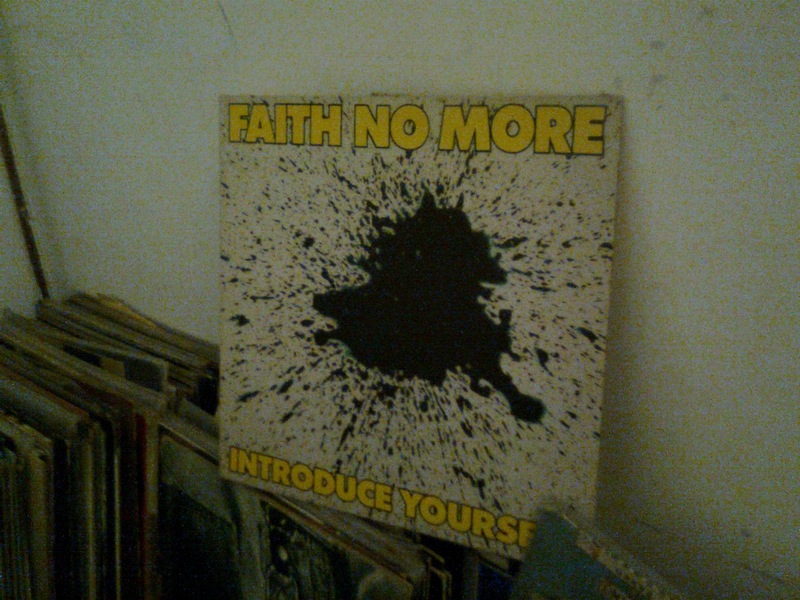 Also the first album by Faith No More - I have a very vivid memory of hearing We Care A Lot for the first time in my kitchen, on the radio, circa 1988, and thinking it was a sign that the Eighties were finally, thankfully, on their way to the trashbin of history. I felt vindicated when Nirvana appeared on the scene. It isn't just that Nirvana were a good band - they were necessary, within the context of the time. 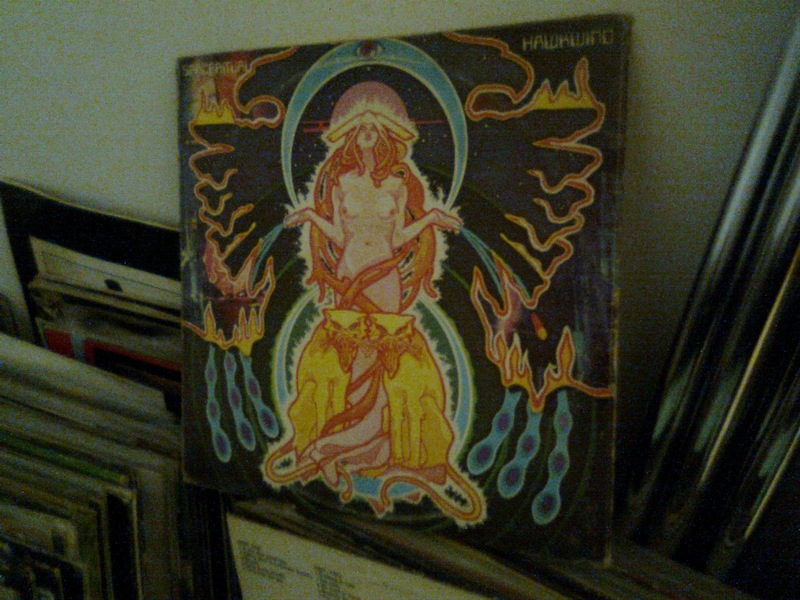 There are albums by Budgie, acquired at various record fairs throughout the Eighties when I went through a blues-rock phase - and their stuff still holds up (some of you might be interested to know they were enormously influential on Metallica, who even recorded an EP of four Budgie tracks sometime in the mid-Eighties). There's an album by Tomita, a delightfully weird-sounding Japanese solo electronica artist, left behind at my house by a friend of a friend. It sat around for a year before I listened to it, and it turned out to be superb (Snowflakes Are Dancing, if you're wondering). 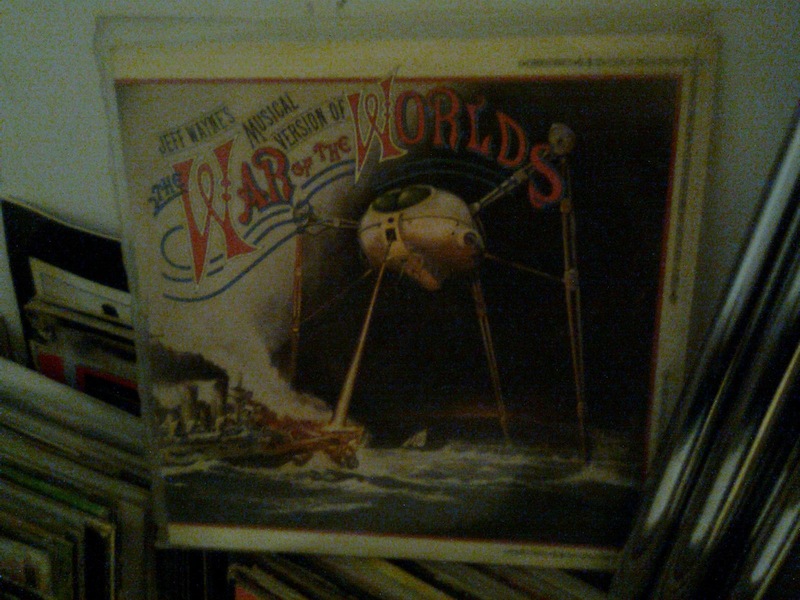 Then there's Jeff Wayne's War of the Worlds (of course), and albums by various goth bands like The Nephilim and The Mission who, for some inexplicable reason, I really rated about two decades ago. A shedload of Zeppelin and Sabbath and...it goes on. Anyway. A couple of years in the Far East does wonders for breaking the bond between a man and his vinyl collection, especially if he doesn't even own a stereo to play them on any more. That makes the vinyl so much useless dead weight. But, it still has some emotional value to me, hence this entry. Sometime in the next week or two I'm going to call a local record shop to come around and make me an offer on them. Given the experience of others, I think it's fair to say I'm not anticipating getting very much money for them at all, but to make myself feel better about it I'm putting whatever I get towards eventually getting myself an Ipad. 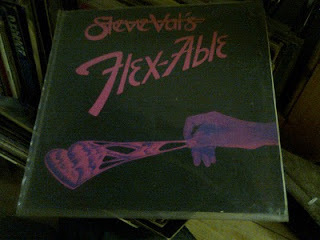 First got this Steve Vai album after hearing a track of his that came on a flexi-disc with Guitar magazine in 1984. Ran out and got this. 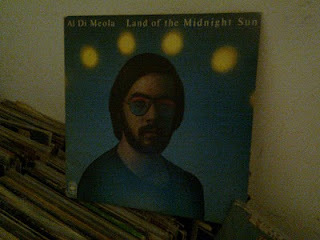 It's still insanely brilliant - not something I can say, unfortunately, for the vast majority of his output since then. Hum a couple of bars from this at any sf convention, and the convention will hum back. Uuuuu-lah! I first heard about Roy Harper when I found out from a friend he was the subject of the song Hats off (to Roy Harper) on Led Zeppelin's third album. He also sang on Have a Cigar on Pink Floyd's Wish You Were Here. 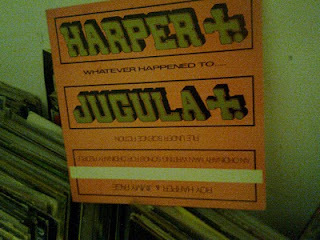 Naturally, when I found out Harper had collaborated on an album with Jimmy Page, I had to have it. It took me a while to get into Hawkwind, but a friend at school was a stone-cold Hawkwind fan. I got into them just as he was getting out of them. Not only that, they're playing Glasgow later this year, and with any luck I'll be there. 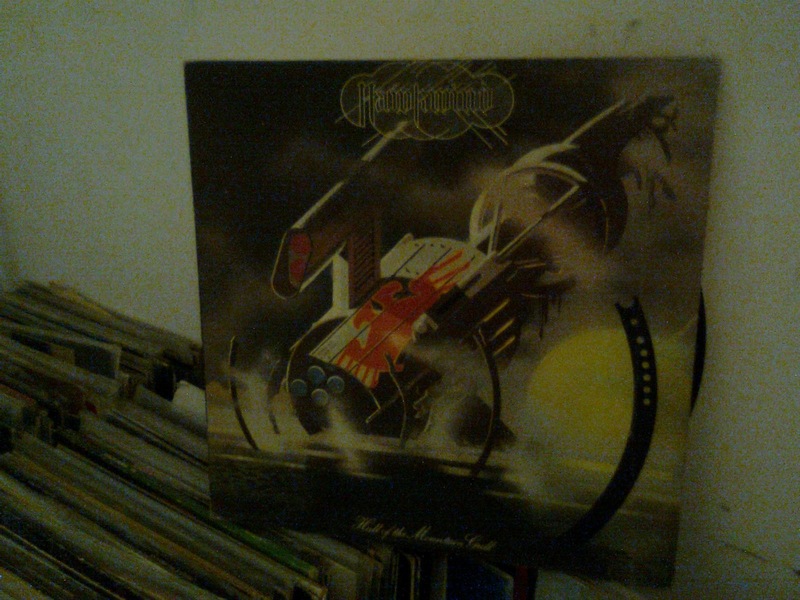 More Hawkwind - the first album by them I ever owned, given to me by the same school friend. It's still my favourite. Picked this Al Di Meola album up when I was going through a major phase of buying albums by guitarists. 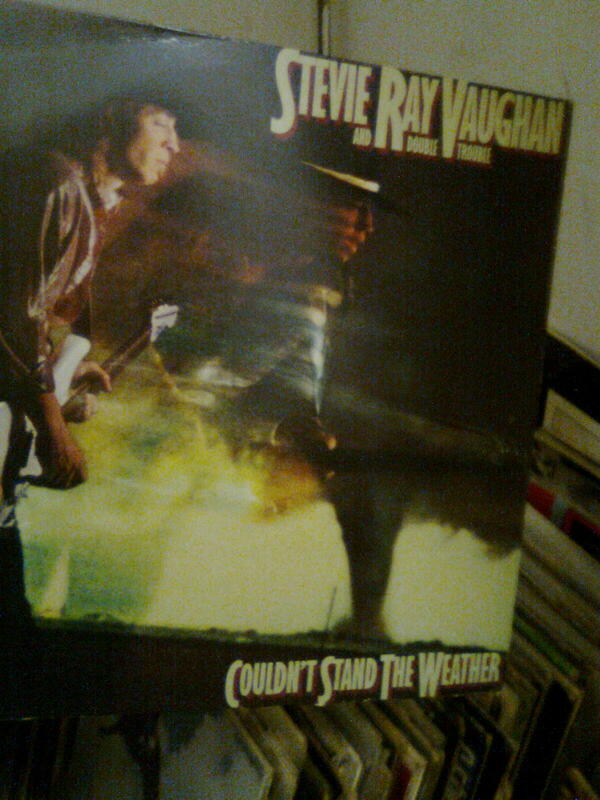 It cost about a quid out of a bargain bin and remains one of my favourites. It's superb. and the Faith No More album I bought about five minutes after hearing We Care A Lot on the radio. I first heard Stevie Ray Vaughan when I saw him play on the (Sunday?) morning at the Reading Rock Festival in, er...1984? The one with the Black Sabbath gig that directly inspired the 'Stonehenge' scene in Spinal Tap, anyway. I remember walking across a field feeling very tired and hearing somebody playing Third Stone from the Sun note-perfect. I just stood and gaped, and bought this album the first day I was back in Glasgow. 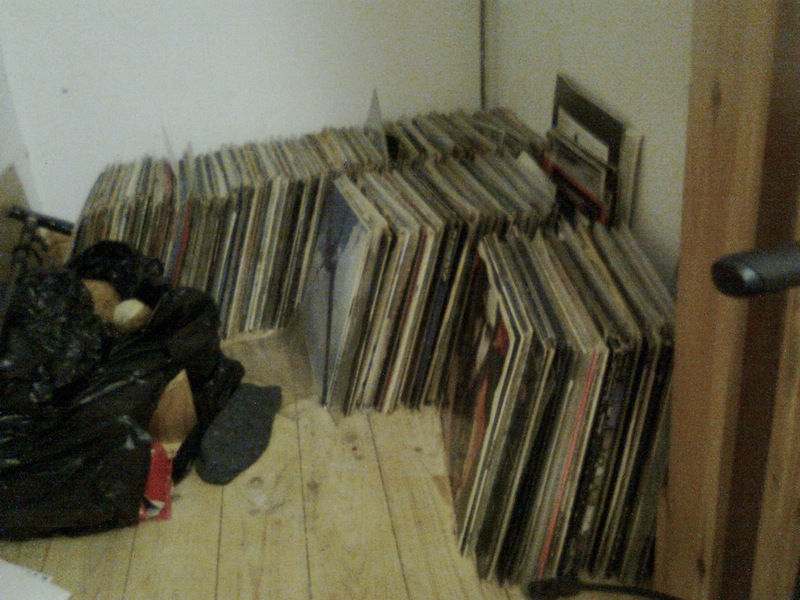 And that's my record collection in its entirety, shoved into a cupboard next to my front door. Sigh. I downloaded some of the white noise files available at whitenoise.com and put them on when I write. I have enough computers going that the fan noise starts to get to me after a while - it all becomes a lot more tolerable when I have something like a light rain or muted thunderstorm playing in the background. Blarkon - I've used white noise generators on my Macbook, that you can usually download free, but I didn't know about Whitenoise.com. Thanks for that (although what I really need, assuming I can justify the expense, is a pair of likely very expensive noise-reducing earphones). Paul - I have a borrowed copy of Record Collectors Rare Record Price Guide 2010 sitting on a shelf near me, and from what I can tell, very little of what I have is worth Ebaying separately. I've kept some aside, however, including the relatively rare Vai and signed Satriani, and a couple of other bits and pieces that might, just might, be worth something. About twenty in total, I think. But even then I suspect I'd be unlikely to get even so much as a couple of tenners for most of them. And yes, I will indeed be royally screwed on a bulk deal, but one way or another, I've decided they've gotta go. I'd recommend you get a second/third/fourth opinion on that Steve Vai album. I saw them sold for 50 Euros ON TAPE, as apparently it is pretty hard to find. Ah, do I know about your vinyl, do I? Eh? Eh? Mind you, I finally ditched 95% of my albums during the flit to Irvine, which was a wrench. I still have my 7" singles though, and a box of 12"ers too. I just need summat to play the things on. When I write I need to have something playing though - and I now have a digimusic collection that easily rivals what I had on vinyl. Once I've finished Ascendant Stars I'll dig through my singles for some tasty rarities!